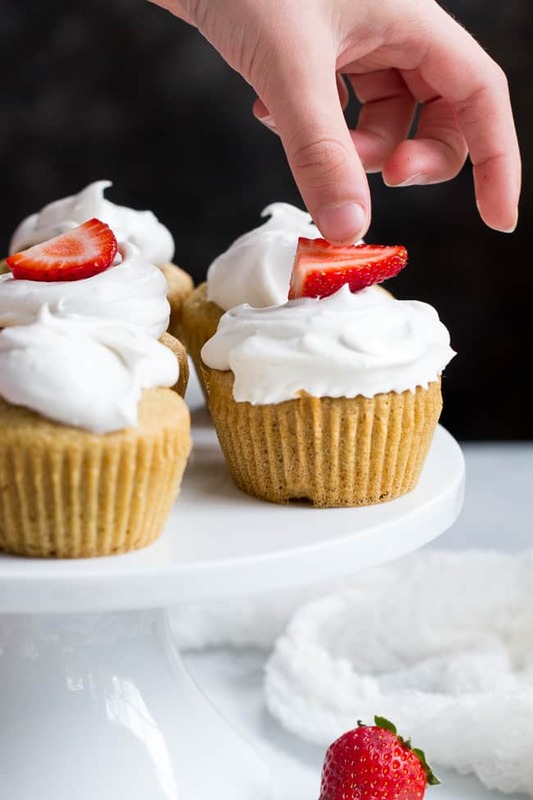 These Strawberry Shortcake Cupcakes start with a perfect paleo vanilla cupcake, filled with honey sweetened strawberry preserves and topped with thick and creamy coconut whipped cream and fresh sliced strawberries. They’re gluten free, dairy free, kid approved, fun to make, and perfect for any special occasion! 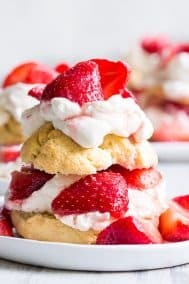 I’ve been dreaming like crazy lately of strawberry desserts, with strawberry shortcake at the top of my list! With all the spring/summer holidays and cookouts coming up, it just feels like the perfect time to go wild with berries. 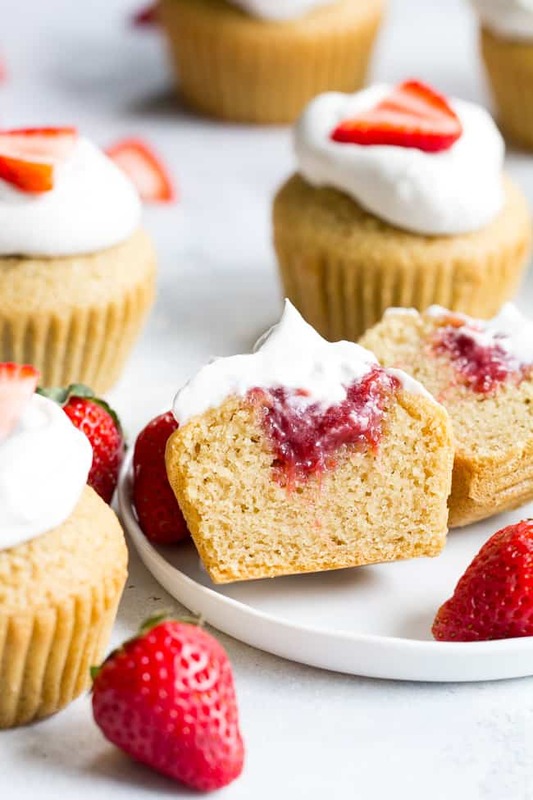 In order to make my dream of strawberry shortcake even more fun, kid friendly, and easy to make, I decided to make them into cupcakes – strawberry shortcake doesn’t get any cuter than this. 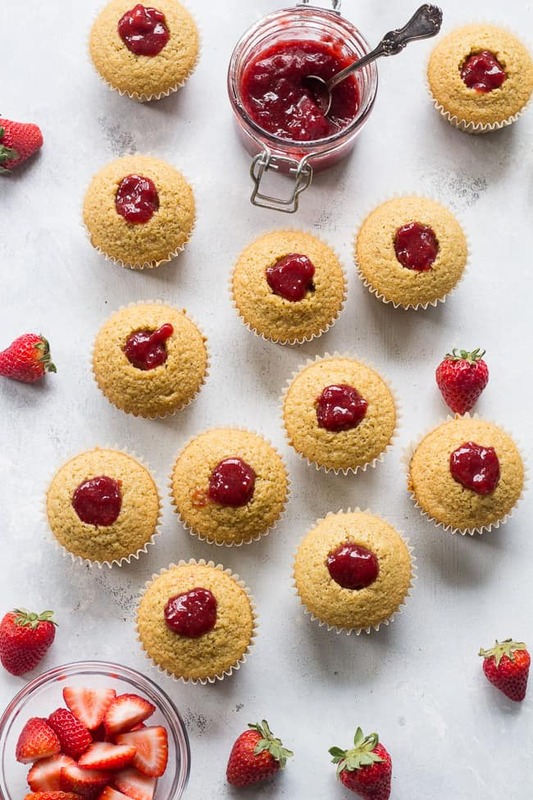 Even if you don’t have a handy little cupcake corer, you can just as easily use a small cookie scooper, melon scooper or even a teaspoon to carefully carve out a little pocket for the honey sweetened strawberry preserves. Just a 1-2 tsp of filling will do, plus if you hate wasting the core, you can always put a piece right back over it since it’ll be hidden with whipped cream anyway. And there’s the whipped cream! For these particular photos, I must admit, I “cheated” guys. I decided to use organic powdered sugar to get the coconut whipped cream even more white and fluffy than is possible with either maple syrup or honey as a sweetener. 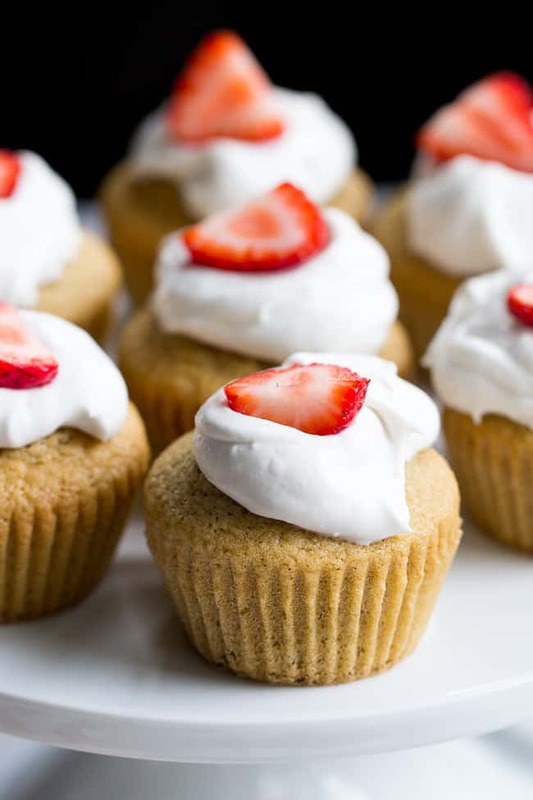 For the next best thing (and what I’ve always done, to make a truly Paleo coconut whipped cream) use creamy raw honey – you’ll get coconut whipped cream that’s creamy but not quite as fluffy, just as delicious (with a hint of honey flavor) and will serve you just as well for the purpose of frosting your cupcakes. One other hint/tip regarding the whipped cream. I’ve used both straight up coconut cream from a can, AND the thick part of a can of coconut milk when making whipped cream. However, lately I’ve come into contact with way too many “duds” with full fat coconut milk, where it would NOT get creamy at all after blending, and would separating into something that looked like cottage cheese. It’s not fun to waste entire cans of coconut milk like that, in fact, it has brought me to tears on occasion! However, when I used canned coconut cream only, (I buy these small 5.4 oz cans) my coconut whipped cream comes out perfectly every time. I figured I’d share this with you since dealing with “surprise! 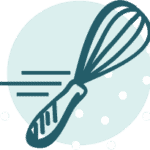 your whipped cream won’t whip!” is never a fun issue to deal with after all the work of making a multi-step recipe like this one. So, with a good can of coconut cream your whipped cream will come together in minutes with an electric hand mixer. 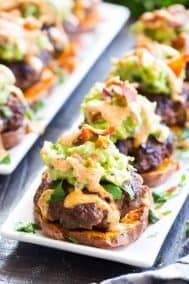 You can make it ahead of time and store it in the fridge, or make it and dollop it on the cupcakes right away. Top with fresh sliced strawberries, and, as always, steal the first bite before anyone knows they’re ready. You’ll be amazed at the taste, trust me! Although perhaps not if you’ve been sneaking tastes throughout the process, as is expected with any baking activity. 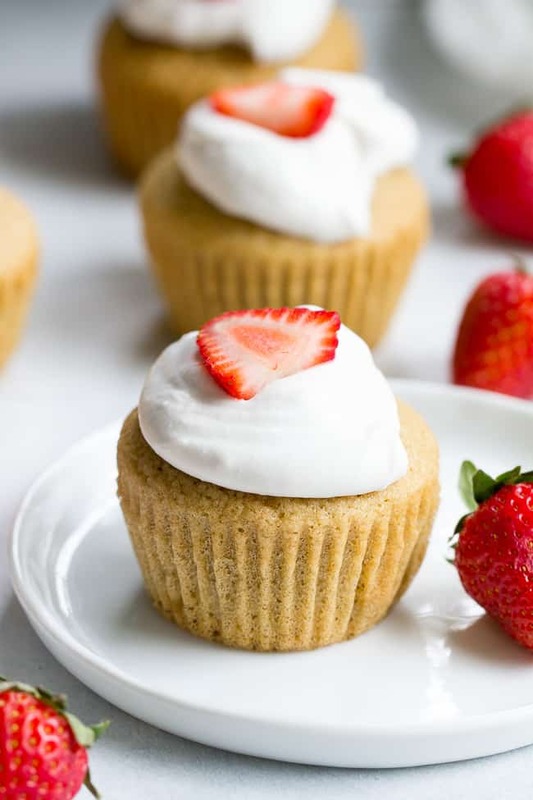 Either way, these strawberry shortcake cupcakes will not disappoint! 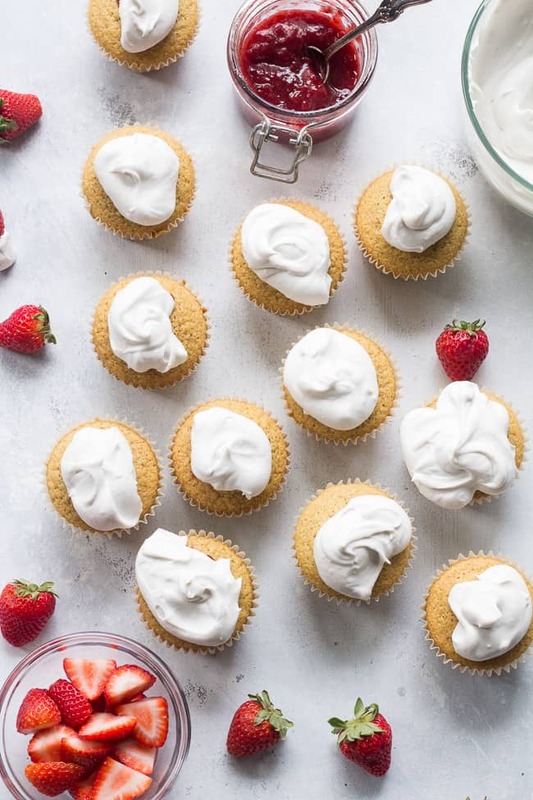 These Strawberry Shortcake Cupcakes start with a perfect paleo vanilla cupcake, filled with honey sweetened strawberry preserves and topped with thick and creamy coconut whipped cream. They're gluten free, dairy free, kid approved, fun to make, and perfect for any special occasion! Bring first two ingredients to a boil in a small saucepan, stirring to prevent burning, then lower the heat to a medium low and whisk in the tapioca (you shouldn't need to mix it with water first if you whisk well). 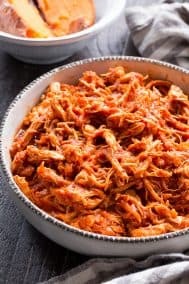 Continue to simmer on low/med-low 20-30 minutes until thickened and reduced, stir occasionally and scrape sides of saucepan to prevent burning. Remove from heat and allow to cool completely, then chill until ready to use. 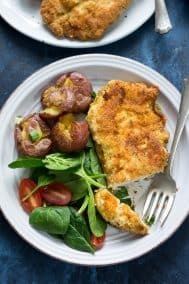 In a medium bowl, combine the almond flour, tapioca flour, baking soda and salt and set aside. In a large bowl, with an electric hand mixer, mix the eggs with the coconut milk, maple sugar, vanilla, vinegar, and coconut oil until well combined. Slowly add the dry mixture to the wet using the mixer on low speed, and once combined, continue to mix on medium for another 30 seconds. Line a 12 cup cupcake pan with parchment liners and fill the liners 3/4 of the way full to make 12 cupcakes. Bake for 15-18 minutes until set, domed, and a toothpick inserted in the center of one comes out clean. 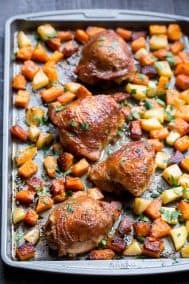 Remove from pan and cool completely on wire racks. Discard any excess water from the cans of coconut cream and place the chilled coconut cream in a large bowl. Beat on low/med with an electric hand mixer until smooth and creamy. Add your sweetener of choice plus the vanilla, and continue to beat on medium speed until fully combined and creamy. Cover and chill until ready to use (it will firm up after being chilled). The whipped cream can also be used right away. 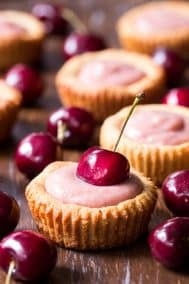 Using a cupcake corer or small cookie scoop, scoop out a small amount of the cupcake's center, enough to fill with about 1-2 tsp of preserves. Repeat for all cupcakes, then spoon in the preserves for each one. *** You will have leftover preserves, which you can store in the refrigerator in a tightly covered container for up to one week. 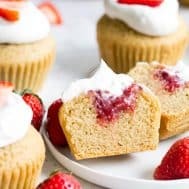 Once cupcakes are filled, top each one with a dollop of chilled coconut whipped cream and a slice or two of fresh strawberry. Serve immediately and enjoy! Store leftovers covered in the refrigerator for up to 3 days. *I highly recommend using canned coconut cream RATHER than the thick part of a can of coconut milk, since it will be more reliable in making the whipped cream. If the coconut milk separates properly, it IS possible to do it with the thick part of the can, however, many brands are "duds" and don't work properly for whipping. **organic powdered sugar keeps the coconut whipped cream snow white and very thick and fluffy. However, sweetening the cream with raw honey is also delicious and will only alter the color and texture slightly. ***If you wish, you can place a small amount of the cupcake core back over the preserves, I did not do this but if you hate waste, no need to worry! 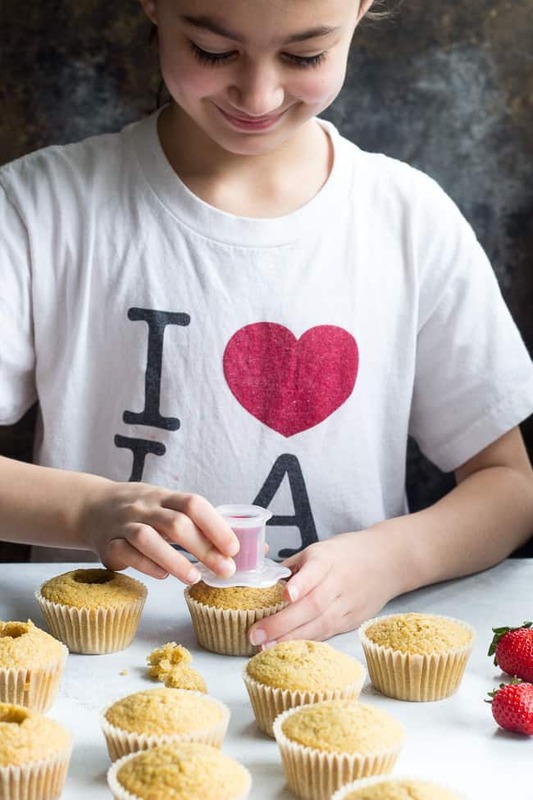 Want more delicious paleo and kid friendly desserts? Try one of these! What gets your vote: full size cake or cupcakes? en plus d’ être paléo donc très sain pour tous . MERCI et CONTINUER longtemps . You could probably adapt this to coconut flour, however you would need a whole lot less. I haven’t tested it but if I were to try I would go with no more than 3/4 cup of coconut flour, keeping all else the same. Hope this helps a bit, let me know how it goes if you try it out. 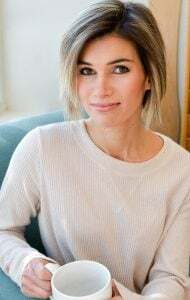 You could try cassava flour. I would say you would need about 1 1/2 c.
Coconut cream is a perfect dairy free frosting, and I’ve never heard of a cupcake corer until now. 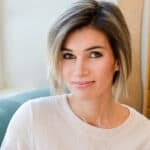 I love how you used Emily’s desire to use it to create a recipe. I skipped the coring and filling and just made as regular strawberry shortcake. And I used raw heavy cream for the whipped cream because my canned coconut cream turned into cottage cheese. It was a big can, so I’ll try the small cans next time. 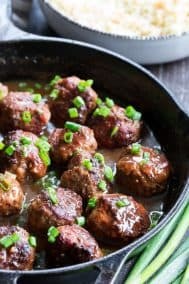 Everyone in between 5 and 45 loved this recipe. Thanks for sharing! I’ve had that problem making coconut whipped cream when I’ve used the thick part of a can of coconut milk rather than the coconut-cream only cans. Some brands of coconut milk are better than others for that purpose for sure. Glad you enjoyed the recipe! You can try putting your bowl in the freezer for a while before you whip the coconut cream, and efinitely be using a metal bowl. I find that creates more reliable results with the coconut cream whipping up nicely. Can I make them as a cake? If so, which cake pan should I use? The baking time would increase also, right? Yup, not sure about the baking time though! I think a 9″ pan perhaps? I baked it in a square Pyrex dish for 22 minutes. It was definitely done. Next time I would try 20-21 minutes. How long will the prepared whipped cream stay fresh in the fridge. I had a lot leftover. Thanks! 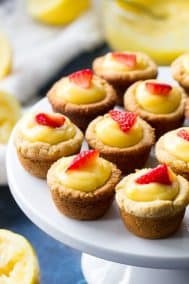 Can I make the cup cakes a few days before needed and freeze them? Then put them together with the strawberry and frosting the day of? I used this vanilla cake recipe and made a pineapple upside cake using butter and maple syrup topped with pineapple rings, pecans, and toasted coconut. It was delicious! Thanks for another great recipe keeper.